When you want to buy a phone, the size is an important factor. It should be something you can easily grasp in one hand and even operate basic tasks like taking a call. So naturally, you start comparing sizes. 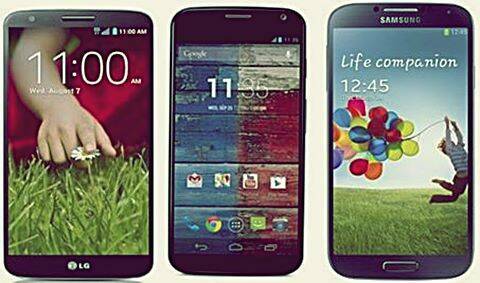 However, if you thought comparing screen sizes was all you needed to do, you’re mistaken. The screen size isn’t always indicative of the full size of the phone. Bezels—the four sides of the frame around the screen—are usually not accounted for and can make a big difference in the size of the phone you get, even if the screen size is the same. For example, take the Sony Xperia Z1 Compact, the Samsung Galaxy S4 Mini and the HTC One Mini. All three of them have 4.3-inch screens. But the difference in length? With the above chart, it’s clear that if you were choosing between the HTC One and the LG G2, you’d get half an inch of extra screen space for an additional millimeter of overall length. Between the Sony Xperia Z1 Compact and the Samsung Galaxy S4 Mini, the latter has smaller bezels and yet makes better use of them by including physical and capacitive buttons on the bottom bezel—the Z1 Compact’s 4.3-inch screen loses further space because of the virtual on-screen buttons. When you’re buying a phone, you want the largest possible touchscreen in it. So when you think a particular size is right for you, make sure you are looking at overall length and then judging the largest screen you can get in it—don’t just go by screen size.